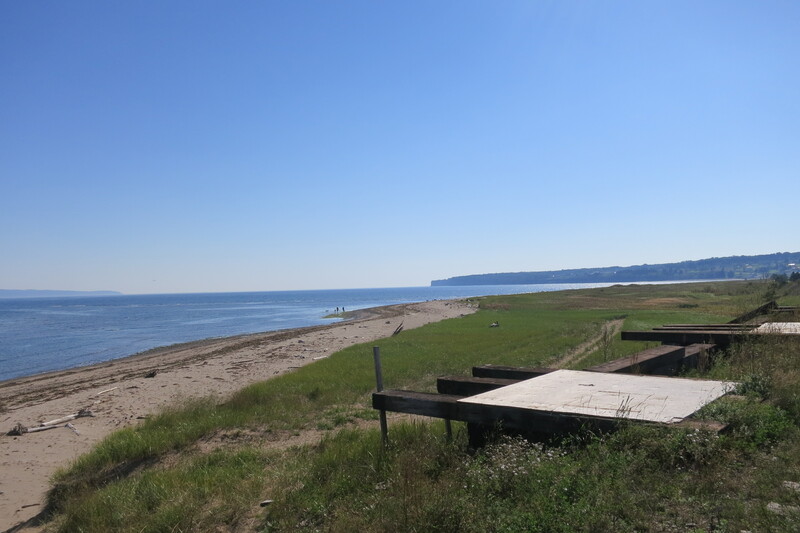 Today, when there’s a freezing blizzard outside, there’s nothing like thinking about Haldimand beach on a scorching hot, humid day in early September, right? Don’t worry, seasonal music is on the way in the coming weeks! But today, I’m very pleased to share with you a bit of collaborative writing that Vicki Boyle LePage and I have have produced for the readers of the blog. Vicki supplied the main content and ideas and I provided a short postface for some added context and additional music (at the end). Resident accordionist Debbie Sams recorded the featured music with her new Tascam portable digital recorder (I just love the warmth and ambiance captured by this recorder). All music was unrehearsed. I decided against editing out all traces of dialogue – these were part of how the evening unfolded and how it sounded. Thanks to Vicki and Debbie for their participation. 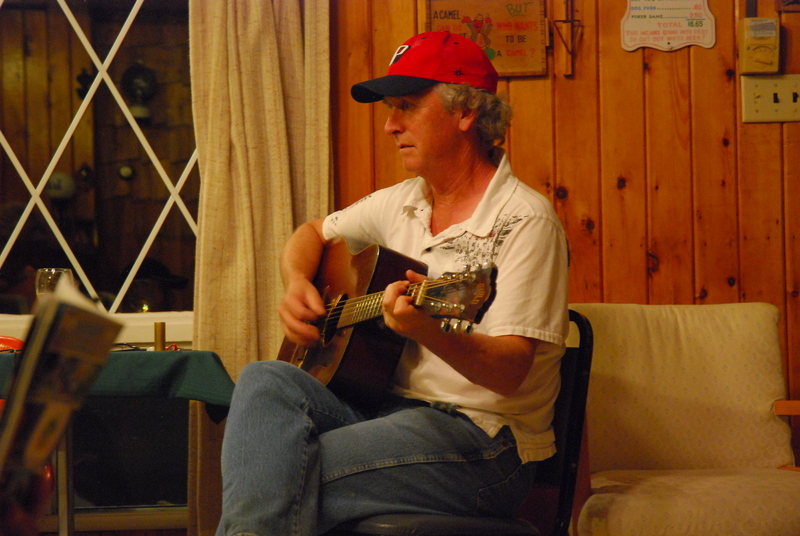 My husband Paul has played guitar for the past forty-two years, since he was eighteen. He has rarely missed a day since then. He started writing his own songs in his early twenties and so far, has made 3 CDs and is well on his way to a fourth. “The Sands of Haldimand” was written in October of 2015. I had been making many trips to Montreal (we live near Edmonton) to help take care of things while my dad was sick and after he passed away and also to help my mum sell and empty their house of forty-six years. Paul was missing me during that time and went for a walk one day with a melody running through his mind. Returning home, he quickly wrote the words to one of his most beautiful songs. It all came together as though it was meant to be. Paul told me on the phone that he had written a song for me. When I asked him to play it he replied, ‘no,’ that he wanted to wait to sing it for me in person. After I returned from Montreal, we sat together on our family room couch and he played the song for me. As he played, the tears grew bigger. It was very emotional for both of us. The words spoke volumes to me about Paul’s understanding of my love for Gaspe and what being there means to me. Apparently, this song has brought many tears to many others as well. I’m proud that my husband wrote the song for me and that it can bring forth such strong emotions for so many who hear it. I was born in Gaspe, to Wesley and Arlene Boyle, and moved with my family to Montreal when I was almost nine years old. My parents socialized mainly with Gaspesians who had also moved away from “home.” Often, there were people playing music at these gatherings. I have many special memories of the times us children were there. Both of my parents were musical. Dad played guitar and harmonica and Mum played guitar, accordion, and some piano. My mum and her sister often played guitar and sang together. One of the occasions where I most remember music were our visits to Jimmy (my dad’s first cousin) and Brigid Miller’s. I recall, more than once, watching Brigid’s brother Johnny sitting playing fiddle with his eyes closed. As a child, I wondered if he was playing in his sleep! The music would continue well into the night while my sister, brother and I would sleep in their big bed. Many times we would be woken and brought to the car half asleep to go home. I loved those music nights. Even though we moved away from Gaspe when I was young, Gaspe has never left me. I wonder if it was, in part, because of the music? I’ve returned to Gaspe nearly every summer since I moved away. And so, I know many people from Gaspe but can’t always recall how or where I met them. For example: Debbie and Hayden Sams (although I do remember Debbie cutting my hair one time when I was staying with my grandparents, Elmer and Violet Patterson). On September 5, 2016, we had an evening of music at Debbie and Hayden’s cottage. It was a wonderful time and was a special evening for both Paul and I, for reasons both similar and different. For Paul it was an opportunity to play music with other musicians and meet some new people. He really loved how his songs sounded with the fiddle and accordion accompaniment by Glenn Patterson and Debbie Sams. Although Paul had never accompanied fiddle music before, he thoroughly enjoyed it and both Glenn and Debbie remarked on how easily he picked up where to change chords. According to Glenn, this skill doesn’t always come easy to even experienced guitarists if they are used to other styles. For me, it gave me a very warm feeling to know that Paul was meeting some Gaspe people and enjoying their company and sharing music. It was also nice to see Andy and Debbie Patterson at the party (Andy’s father and my grandfather were twin brothers). Andy and Debbie had had us for dinner with Debbie and Hayden previously during our visit where Paul also played a few of his songs. And so the music led us to Debbie and Hayden’s cottage a few days later. During our visit to Gaspe, Paul had a few other opportunities to play music for and with others. It has given him a means of connecting with some of the people there. I am so happy that Paul has found his own way to love being in Gaspe. I hope the music will continue each time we are there and that his connection to the people and place will continue to grow. At the end of the Labour Day weekend, on September 5th, I met up with Debbie and Hayden Sams at their beachfront cottage in Haldimand after spending a few hours at the 2nd annual corn boil at O’Hara’s Point hosted by the York River Seniors Club. August had been a very busy month with festivals, research, and long-distance driving and by September 5th, I was in need of a day to simply relax. It was an exceptionally warm afternoon and many of us were exhausted from the heat. But I was glad of the invitation to celebrate the long weekend a little longer and be taken care of with food and good company. Still, I was ready to throw in the towel and head home after dinner, without even having opened the fiddle case. I took a few minutes alone in the car to regroup and decided it would be poor form not to at least play a few tunes. I went back inside and Debbie and I started with some piano and button accordion duets. We were soon joined by a visiting singer-songwriter, Paul LePage (originally from Montreal) who is married to Vicki Boyle. I soon switched to the fiddle as he began sharing songs with us. There was a unique chemistry that quickly developed. An ease ensued between the musicians and the group of friends from near and far who had gathered at Debbie and Hayden’s cottage. I often think about how music brings people together – musicians and non-musicians alike – and how it serves to pass on aspects of a culture. 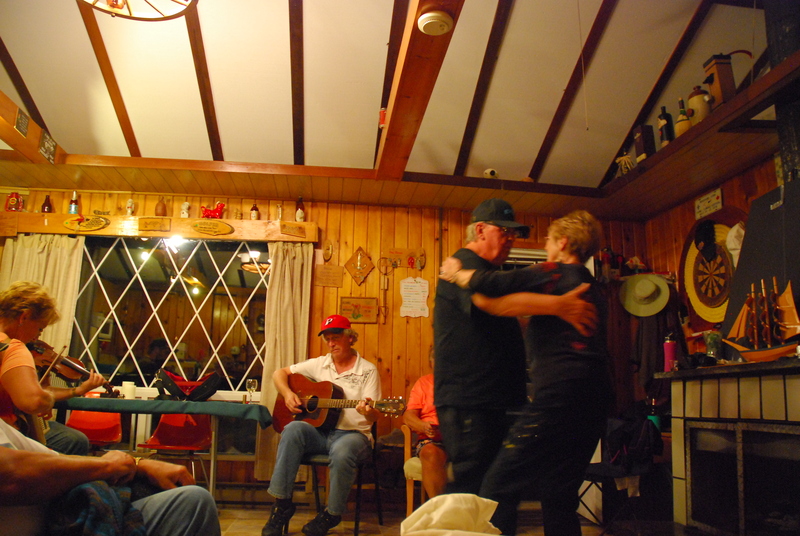 Many times in Gaspé, I’ve seen informal music making at the core of how people socialize. At the end of the evening, I chatted with Paul’s wife and it was clear to both of us that something special had taken place. I asked her if she would consider writing about this special evening, one of the songs that Paul performed that night, “The Sands of Haldimand,” and her powerful relationship to Gaspé which is partly rooted in being around music in the Gaspesian community. This truly was a special evening, so happy to share it with others … thanks Paul and Vicki and Glenn. Vicki is my neice and she was born on my 12th birthday. We have always had a wonderful relationship. I sang with sweet Adelines(4 part harmony) chorus. I would love to be in the company of these wonderful musicians some day.